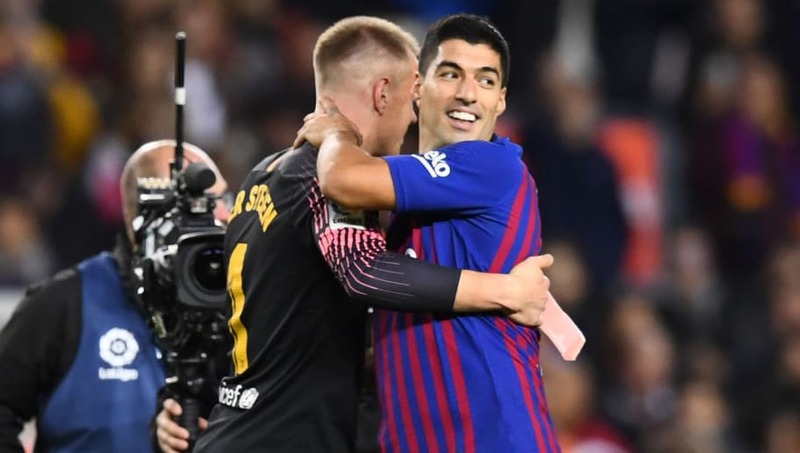 Barcelona forward, Luis Suarez, has hailed goalkeeper Marc-Andre ter Stegen following his heroic performance at Athletic Bilbao on Sunday, branding the German as "one of the best in the world." The defending champions played out a goalless draw against Athletic Bilbao in La Liga on Sunday night. The Blaugrana were lucky to escape with a point, as the visitors were thoroughly the second-best on the night. Fortunately for Barcelona, their shot-stopper, Marc-Andre ter Stegen, was at his dependable best and made some superb saves to deny Athletic a much-deserved win. The German did well to deny Markel Susaeta and Inaki Williams on either side of half-time, as both of their efforts looked destined to hit the back of the net. Following his impressive performance, Luis Suarez, couldn't help but shower him with praise. Suarez told La Liga TV, as per ​Football 360: "He’s one of the best in the world, no question. He showed it again – that’s why he’s the Barcelona keeper." Barcelona boss, Ernesto Valverde, also had some kind words. He added: "He’s made some amazing saves, especially the last one, it was incredible." Analysing Barcelona's performance he said: "We couldn’t really get going in the last third of the field. We thought the game would have more rhythm and it just didn’t turn out like that." Suárez: "Ter Stegen is one of the best goalkeepers in the world." "We’re just responsible for what we do and I think in general, we should have created more than we did. They pressed us high, but we did get through that and we did get through to their box." "But then that left us exposed to counter-attacks and they created problems," he concluded.